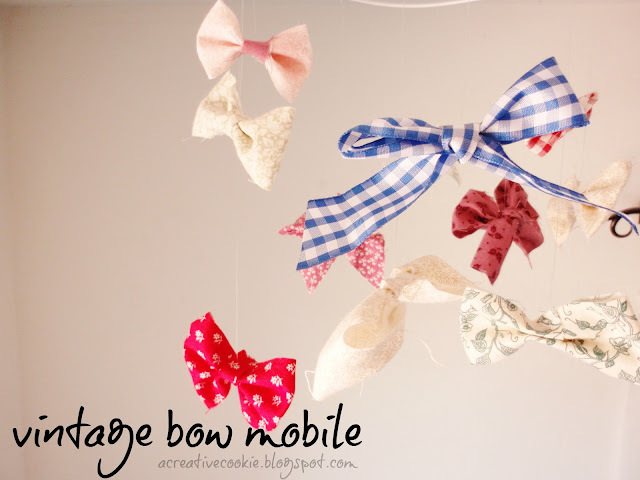 Today I am going to show you how to make your own vintage bow mobile with some fabric scraps! While I was searching for an embroidery hoop in the garage (I was going to make the base an embroidery hoop but I couldn't find any) I came across a bin of my mom's old fabric scraps. In fact, the hot pink and white polka dot fabric in the photo above came from my mom's bridesmaids dresses! Most of the fabric is pretty old and I thought it had a vintage-y feel to it, so I went ahead and used it. Cut off the hook of your wire hanger. Bend the wire into a circle by wrapping it around something large and round (I used a paint can). Twist the ends together and cut off the excess with wire cutters. You should have something like the result above. My hanger was already white with some of the covering rubbed off in some places. I decided to leave it, because it added to the whole vintage look. Bow #1. Cut a long, narrow piece of fabric and a smaller one. Take the larger piece and bring the two ends to the center. Then pinch the fabric in the center and wrap the smaller piece around the center. Glue the small piece together on the back of the bow. Bow #2. Do the same exact thing with bow 2 but instead of wrapping the smaller piece around, simple put a few stitches in it. Bow #3 (the faux bow). Take a long piece of fabric and tie a tight knot in the center. Bring the two ends together toward the knot and glue them down in the back. From the front it looks like an ordinary bow. 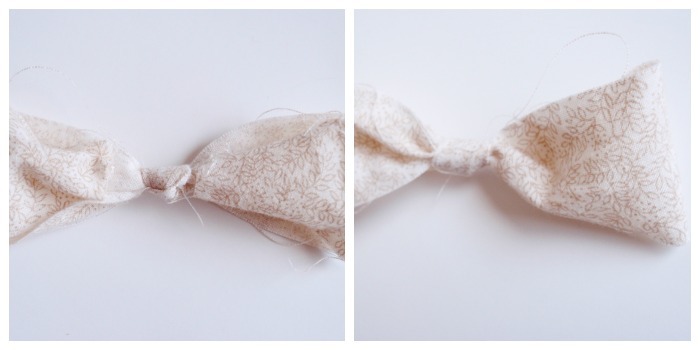 Experiment with different sizes and styles for your bows. I loved trying out new ways to tie bows and learned a lot from this project! To attach the bows to the mobile, take your needle and thread fishing line through your bows (this is one reason why you want to limit your hot glue because the needle won't go through it). Knot it three times at the bottom so it won't fall through your fabric, and tie the other end of the line to your hoop.